I don’t know about you girls, but I have a love-hate relationship with Christmas crackers! On one hand, no festive table is complete without a beautiful cracker on your place setting and Christmas just wouldn’t be the same without the fun of pulling on crackers with loved ones. But, on the other hand, they are so pricey and the goodies inside are almost always a disappointment. I don’t mind spending on crackers, but I’d rather put my money where it matters… in the fillers! I guess you could say, I’m the kind of person who would rather you spend more on the gift itself and minimal packaging (but still pretty), rather than the other way around. Well, I got a brilliant idea thanks to my sister in law. Make your own Christmas crackers! Now I know what you thinking…. I don’t the have time, I don’t have the energy and where on earth do I get everything I need? My answer is simple! Buy any old cracker with the cheapest, crappiest fillers and replace them with something more exciting! I’ve never technically “made” my own crackers from scratch, but for the last three Christmases that we’ve hosted, I’ve made up my own fillers and they’ve always been a hit. So much more exciting than nail clippers! Throughout the year, I collect cute little samples to put in my Christmas crackers. I buy what ever cracker to match my theme for the table (this year I’m going with graphic red and white as you can probably tell) and then just open them up and fill them with better stuffing, tie the ends and you’re good to go! Fragrance samples are always a winner and if you start collecting early, you can get enough to fill your crackers. 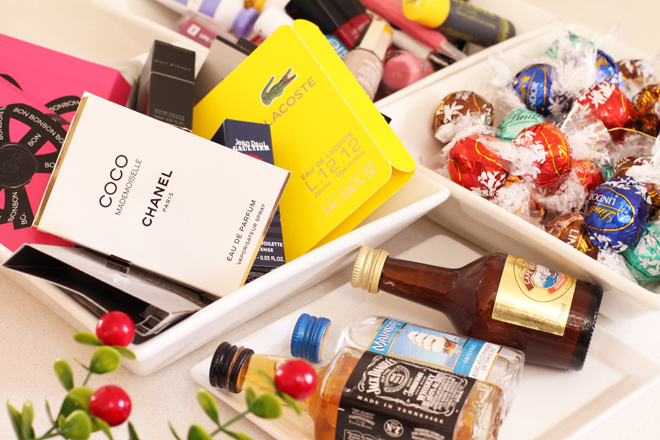 But don’t just think fragrances… you’ll be surprised at how many cosmetic samples you come across throughout the year. Cute little samples of body cream or eye makeup remover make great cracker fillers for ladies. If you haven’t been collecting samples there’s lots of other stuff you can load up into your crackers. 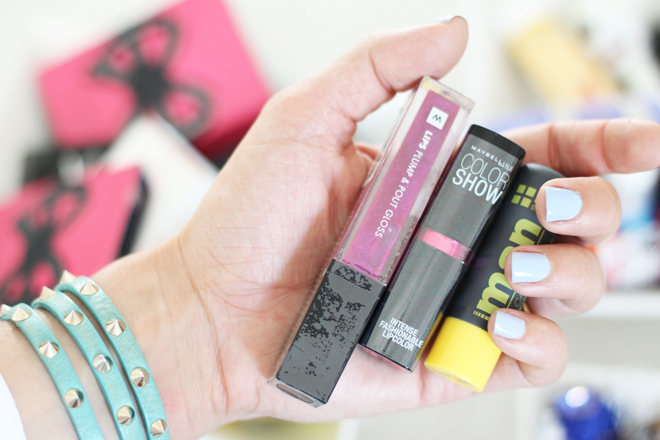 Think lip balms, inexpensive makeup like lipstick and mono eye-shadows or even Woolie’s nail polish remover wipes. Full sized or miniature nail polishes also make cute fillers as do other fun little travel sized treats. For the guys, NIMUE have a beautiful lip balm called Nimue Man that would make a great cracker filler for him. 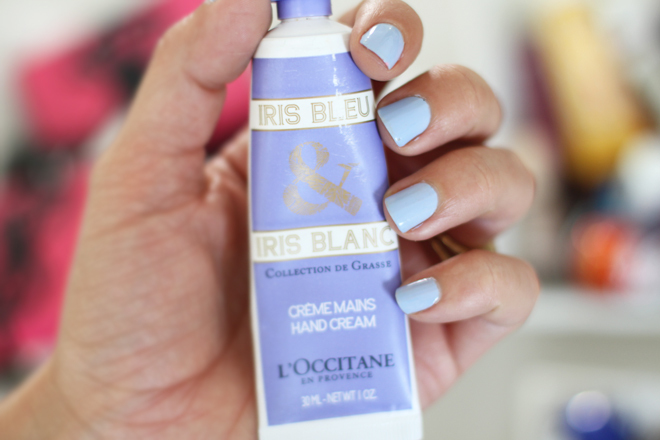 If you’ve got a bit more of a budget, then I’d suggest a beautiful L’OCCITANE miniature hand cream for the girls. They are amazing and your lady guests will smile ear to ear at such a lovely treat. You can pick up a beautiful L’OCCITANE Hand Cream Trio (that’s a gift in it’s own right) for R295 which works out to under R99 each, or you can choose your own individual travel size goodies from L’OCCITANE starting at R105 each. 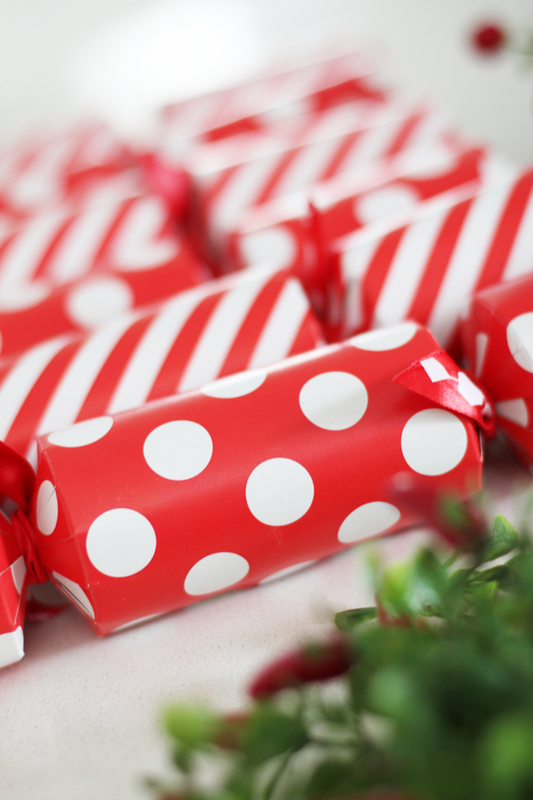 How about making the Christmas cracker the gift itself? So lets say you’ve budgeted X amount per person on a small gift, why not make it one exciting one? Load up the cracker with personalised little treats, write their name on it and see them smile. 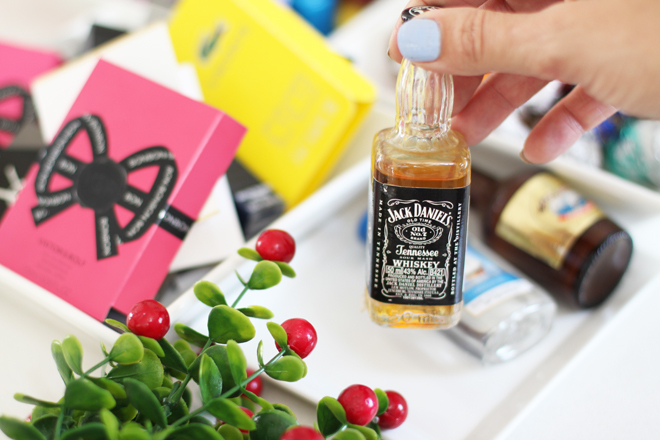 Guys are a little more difficult to find crackers fillers for, but fragrance samples and miniature liqueurs or other alcoholic spirits are also a cute idea. For something a little more “wow” for him, you could even fill his cracker with techie things like a USB drive or a power bank. If he’s into cool superhero stuff (and which guy isn’t? ), he’ll love a cute superhero inspired USB drive from Tribe at Superbalist. 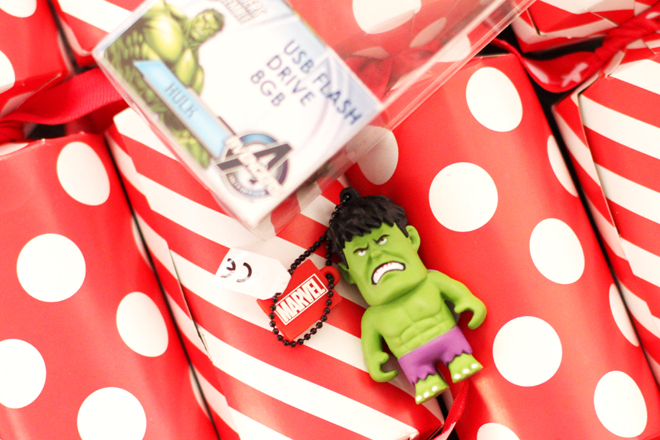 How adorbs is this Hulk one (R249)? They also have a Bart Simpson, Bob Marley, John Lennon, Spiderman, Ironman and Captain America one to make him smile. You’ll have to take the superhero out of the packaging (maybe give it to him afterwards), but trust me, these will be great cracker fillers that guys will actually love you for! If you’ve already got your heart set on a gift, and would rather just do the crackers with something more excitin, why not fill your crackers with edible treats? I mean, I’d rather have three delicious Lindor balls exploding from my cracker than a pair of ugly old nail clippers. 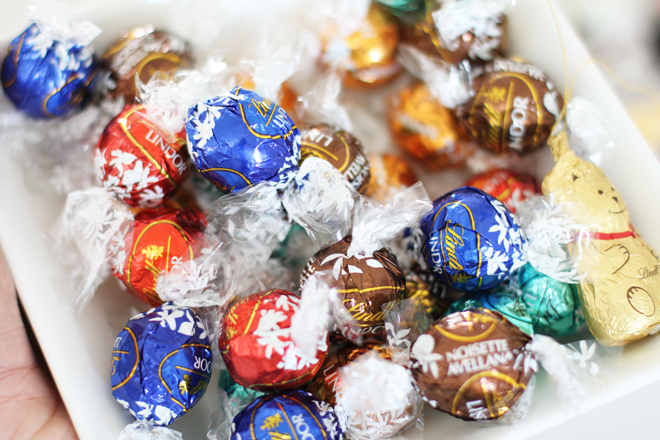 If you’re around Sandton City, pop past the Lindt Boutique store and load up on some Lindor balls. Pick and mix your flavours, weigh and pay and make your cracker fillers more exciting. 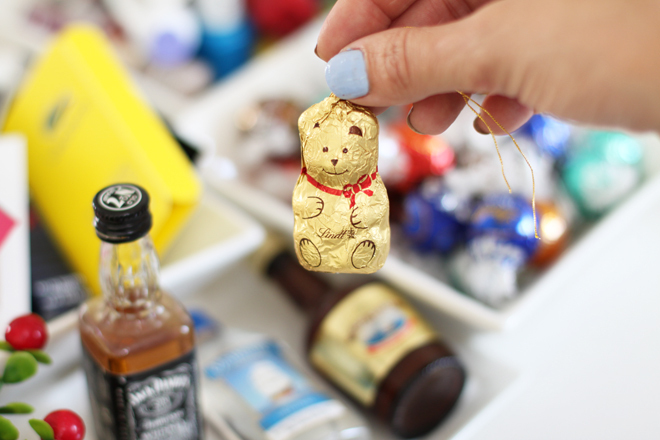 They’ve even added these cute and cuddly teddy Lindt chocolates to the Pick & Mix selection. Ohh, by the way, these would also make cute Christmas Tree ornaments don’t you think? Skip the Christmas dessert (you’ll probably eat more than enough) and invite your guests to dig into the Christmas tree ornaments instead. That way, you wont even have to endure the dreaded Christmas bauble breaking or packing away your ornaments. SCORE! 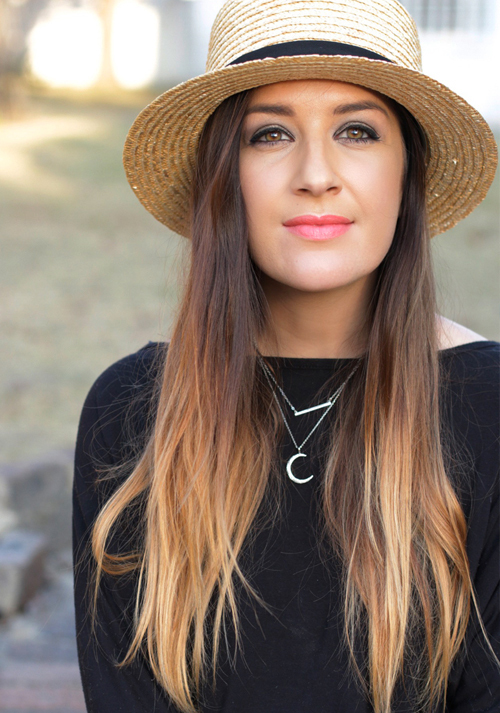 If you’ve got more Christmas filler ideas, comment below and let me know! As always, I’d love to hear your thoughts!